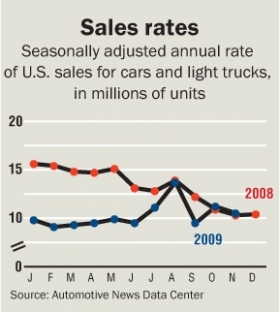 As the year winds down, sales of new cars and light trucks in the United States don't get any better. The experts who predicted an upturn in 2009 might consider some other line of work. For the past two months, industry sales have been close to year-ago numbers. That's hardly good news; last year's sales were rotten. October deliveries were 216 below 2008; November's count was 35 above last year's. November sales numbered 747,086. The year-to-date tally through November was 9,401,432, down 24 percent from last year. About the only favorable thing that can be said about this year's sales is that they almost certainly will top 10 million. There were times this year when that did not appear likely. This year probably will wind up with about 10.3 million sales. That would be 22 percent fewer than in 2008. The seasonally adjusted annual rate of sales was 10.5 million in November, down a bit from 11.2 million in October. The year's high point was August, when sales were swollen by the cash-for-clunkers program. Clunker cash pushed the SAAR to 13.7 million for August, a rate that obviously couldn't be sustained. Sad as they are, the numbers must be viewed historically. The 10.3 million is a moon shot away from the 16 million that had been considered normal in the early years of this century. From 1998 through 2007, the industry averaged 16.7 million new-vehicle sales a year. This year's 10.3 million will be 38 percent below that. In November, domestic-brand sales of Ford Motor Co. and General Motors Co. just about matched last year's results. But compared with 2007, GM was down 42 percent and Ford was off 29 percent. Chrysler Group sales plunged 25 percent from last year. It was the third month in a row Chrysler Group sales were down 25 percent or more. On the encouraging side, all four of GM's surviving brands reported year-to-year sales gains in November. Chevrolet, Cadillac, Buick and GMC were up 5 percent or more over 2008. The other side of the coin found Pontiac, Saturn and Hummer down a combined 48 percent. Each is on a going-going-gone sales track. The Ford brand also was on the plus side for November, but no such luck at Chrysler Group. Sales trailed last year's for all three brands -- all four brands if, as the company does, you count the Dodge Ram pickup as a separate make. All by itself, the Ram was off 37 percent. Only one of the major import-brand automakers reported bad news for November. American Honda Motor Co. trailed last year by 3 percent. Hyundai-Kia Automotive zoomed up 34 percent over last November, and Nissan North America listed a 21 percent advance. Toyota Motor Sales U.S.A. gained 3 percent. The car-truck split was nearly even in November, with cars outselling trucks by 33,424 units. For 11 months, cars are 917,342 units ahead, and import-badged brands have supplied all the momentum. New-car sales are still a sometimes thing for the Detroit 3; they had just 31 percent of car sales in the first 11 months of this year. In 1984, on the eve of the truck sales boom, domestic brands had 77 percent of the U.S. car market. Detroit is striving mightily to regain dominance in the car sector, but it is a long, brutal campaign.